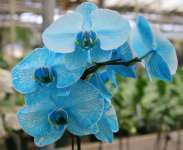 Kalyani, I have not seen the blue anthurium, but I suspect I know what is up, because I _have_ seen "blue" Phalaenopsis orchids. They were actually just white Phalaenopsis orchids which had been fed some kind of dye to make their flowers appear blue. On the subsequent blooming, they would of course be back to white again. I suspect the same thing is happening with "blue" anthurium. purchase a plant (or plants). Thank you. > Now they're going too far! > Kalyani, I have not seen the blue anthurium, but I suspect I know what is up, because I _have_ seen "blue" Phalaenopsis orchids. 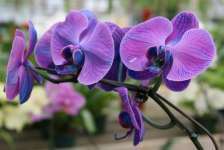 They were actual ly just white Phalaenopsis orchids which had been fed some kind of dye to m ake their flowers appear blue. On the subsequent blooming, they would of course be back to white again. I suspect the same thing is happening wi th "blue" anthurium. > and how I can purchase a plant (or plants). Thank you. > Kalyani Dias Ph. D.
> > than "Re: Contents of Aroid-L digest..."
> > Now they're going too far! ugh. Interestingly enough, the blue Phalenopsis are the result of injecting dye directly into the flower spike. a neat little round hole. A new twist on the old way of dyeing carnations. As Jason says, if you read the fine print they admit that future flowers wi ll be white. > the market and how I can purchase a plant (or plants). Thank you. the roots in blue dye ... and got blue roots! Flowers were unaffected. useful plant to it's culture*"